I’m always doing the same images looking outside trying to look inside. Trying to tell something that’s true. But maybe nothing is really true except what’s out there. And what’s out there is always different. (Robert Frank voice over in Home Improvements (1985)). In a series of monographs since 2004, George Kouvaros has set about redeeming realist film from the clutches of post-structuralist film theory. In Where Does it Happen? 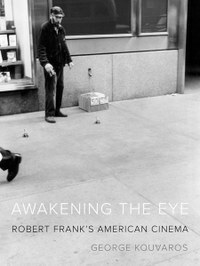 John Cassavetes and the Cinema at the Breaking Point (2004), Paul Schrader (2008), Famous Faces Not Yet Themselves: The Misfits and Icons of Postwar America (2010) and now Awakening the Eye: Robert Frank’s American Cinema (2015) Kouvaros focuses his attention on the capacity of specific oeuvres or productions (John Huston’s troubled The Misfits for Famous Faces …) to resist the vicissitudes of scholarship and the delimiting effects of prevailing modes of criticism. At the heart of this body of writing lies a fidelity to the films at hand, seeking to render the objects of study on their own terms and within the contexts from which they emerge. In describing Kouvaros’s approach to criticism, work is a most appropriate term – the pleasure in reading his books lies in being taken on a journey of discovery, of uncovering the connections, of seeking the best language to use and the most useful references on which to draw. Each book is carefully thought-through, composed and assured. While less than emphatic, the work’s grounding in the encounter with the objects of analysis gives rise to moments of connection, contemplation and analysis that are always intriguing, often resounding. In Awakening the Eye Kouvaros begins again, going to the films, insisting on the close analysis of images and sounds to divine the forces and contexts that have shaped Frank’s cinema. Each chapter groups a few of the films together: Conversations in Vermont, Liferaft Earth (1969), About Me: A Musical (1971) and Cocksucker Blues comprise chapter 3 “A Better Way to Live”; Life Dances On … (1980), Home Improvements and The Present are treated as a trilogy in chapter 4 “The Fire of Pain”. While chronological, these groupings are also conceptual and thematic. In contrast to the better-known observational approach of cinema vérité filmmakers such as Richard Leacock and D. A. Pennebaker, Frank’s films are more closely aligned with the work of Emile de Antonio and Shirley Clarke. In the latter’s The Connection (1961) (a companion-piece to Frank’s Pull My Daisy) and Portrait of Jason (1967), we encounter a cinema that, according to Kouvaros, “is based on the interrelationship between the experiences and doubts of the filmmaker and those of the subjects before the camera” (91). A key to locating Frank through his films is the notion of an “essential incompleteness” (155). In the majestic concluding chapter “Fragments Shored Against My Ruins” concerning Moving Pictures (1994) and True Story (2008), from which this quotation is drawn, Kouvaros argues that the director’s utilisation of fragmentation is “more than a process of interruption or cutting things short; it also involves a process of moving between – between past and present as well as between images and text” (155). As demonstrated in Moving Images, Frank complicates the temporality of the work by writing over the images – just has he did with his still photographs. This process of inscription is part of an approach to the past that is “palimpsestic” (157). More than simply superimposing one thing on top of another, Frank’s palimpsestic approach also instigates a metaphoric process of essaying, of thinking concretely about the relationship between the passing of time and the image. The theoretical keynote of the book is Kouvaros’ claim that Frank’s work involves a “coming together of melancholic vision and allegorical technique”(177). Drawing on Water Benjamin’s The Origin of German Tragic Drama, he forefronts the “creative disposition” of melancholy, diverging from common derivations of the term as a mood or psychological state (192). The various letters, photographs and souvenirs that Frank’s camera scrutinises function as “significant fragments”: “They have become . . . part of a compulsive puzzling over meaning that is drawn to the phenomena of a decaying world”. (177) This “melancholic method” also drives Frank’s need to return to his earlier films and photographs. Guided by the director’s deeply personal voice-over, we grasp the curiousness of images – their capacity to be transformed into what Kouvaros, in one of his best phrases, calls ciphers of “enigmatic wisdom” (192). This attentive scholarly prose represents a continuation of Kouvaros’s own oeuvre of intriguing critical work. As I have suggested, this oeuvre endeavours to take its topics on their own terms, seeking to divine what lies at their heart. In this way, Kouvaros’s rendering of Robert Frank’s audiovisual work doubles the subjectivity, making us keenly aware of Frank’s work as well as the author’s own personal approach. Following the epigraph used at the start of this review, Awakening the Eye is the latest in George Kouvaros’s ongoing realist criticism, productively enervating Frank’s audio-visions from the inside and thereby remaking them anew for contemporary scholarship. The exception to this is the edited volume Frank Films: The Film and Video Work of Robert Frank, edited by Brigitta Burger-Utzer and Stefan Grissemann (Zurich: Scalo, 2003).